Based on my experience with numerous iPad apps that try to teach your juniors about letters of the alphabet, I conclude that they must have these three core ingredients: letter association, sing-along ABC song and interactive animation. Finding a good app that has all of those ingredients is not an easy thing to do. On rare occasions, we may encounter apps that have unique value propositions such as apps with special theme or apps with an extensive collection of vocabularies. Each page has an animal playing a musical instrument whose names start with the same letter. Wee Sing & Learn ABC is a special app developed based on a book with the same title that was released in August 2001. The book was written by Pamela Conn Beall and Susan Hagen Nipp, who have been publishing children songbooks since 1972. 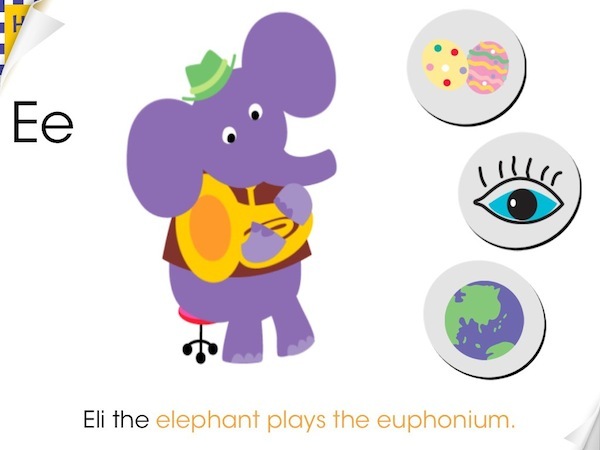 Within the book (and the app), you will find 26 different animals that play 26 different musical instruments. 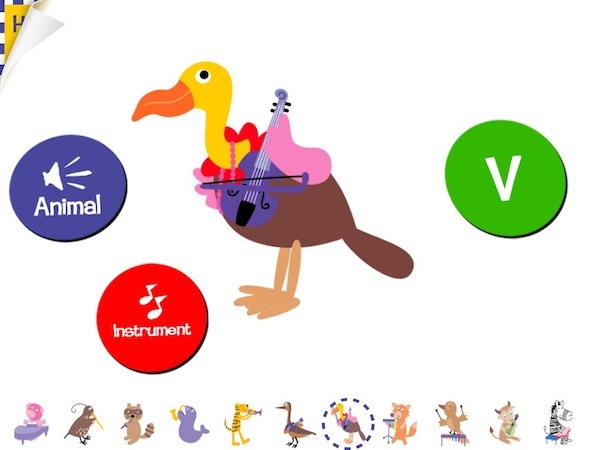 On each of the 26 pages, you will also find a read-along text that identifies the name of the animal, the fictional name for the character and the name of the musical instruments. All of them start with the same letter, e.g. Abe the alligator plays the accordion. The iOS app brings a new dimension to the physical book. In addition to the original sound of the musical instruments (as recorded from various places around the world), you can also watch the animation and interact with the animal. Even though I haven't listened to the audio CD that is available as a separate physical product, I believe that you will hear the same musical instruments as you would from the iOS app. Finally, the app also features three additional buttons that you can tap to trigger the voice overs for each of the selected items. This feature allows your juniors to learn new vocabularies associated with the items shown on the buttons. Too bad the items shown on the iOS app are not as many as the ones shown in the physical book. The Explore Animals play mode allows you to hear only the sound of musical instruments without any singing voice. Wee Sing & Learn ABC has seven play modes that your juniors can try. Three of these modes, i.e. Auto Play, Read to Me, and Read to Myself, would lead them to walk through the book from A to Z, passing through all 26 animals sequentially (without any way of skipping past several of them). In each page, you will hear the animal sound, the letter's name, a voice over reading the read-along text, an original music that plays along the singing voice who will read that text as lyric to the music, and the name of additional objects as you tap them. The ABC Song play mode allows your juniors to listen to the ABC song. With a slightly different lyrics and scrolling sets of letters, I'm sure your juniors would find it interesting. The other two modes, i.e. Explore ABC and Play Along, allow your juniors to play with 26 buttons representing A-Z. They can tap each button and a voice over will pronounce the letter's name. In the Play Along mode, your juniors can try to feel the beat and synchronize the way they tap the A-Z buttons with the musical background that plays to the tune of the ABC song. Finally, the Explore Animals play mode allows your juniors to select any animal they like to play with. They can swipe through the scrolling list of animals on the bottom of the page, and tap on the one they like to play with. With a slightly different page layout than the first three play modes, you can hear how each musical instrument would sound if it were played without having any singing voice. The ABC Song in this app has a slightly different ending. "The interactive graphics, narration, and music in this app will enhance their language development, listening skills, and retention in such a fun way," said Nipp. Beall adds, "The Wee Sing & Learn ABC app effectively teaches letters and language through the use of music along with charming animation and genuine sounds to explore." I personally think that the app's unique value propositions lie in its ability to play the original animal sounds and the original tunes of musical instruments. Being able to release the audio CD version seven years ago really helps with the audio production and quality of this app. The songs are also simple enough for younger juniors to sing along and repeat them on their own. The Play Along mode allows you to time your taps according to the ABC Song background music. Wee Sing & Learn ABC is a unique app that you might want to consider adding to your collection of apps that try to teach letters of the alphabet to your younger juniors. If your juniors love musical apps, and you're looking for something different than the standard ABC song apps, I would recommend you get this app.